Walsh University welcomed Ambassador Tony P. Hall as this year’s keynote speaker for the spring Commencement Ceremony on Sunday, April 29. 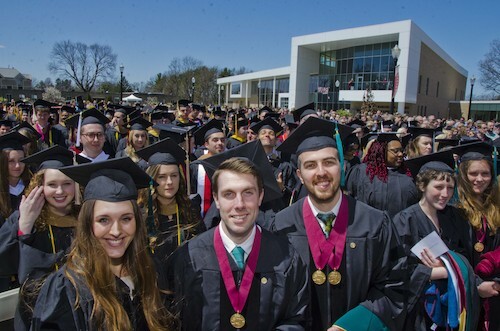 During the formal ceremony, more than 400 graduates were awarded their respective associate, bachelor’s, master’s and doctorate degrees. They join the 211 graduates from Walsh’s winter Commencement Ceremony for a total of 617 graduates for the 2017-18 academic year. Approximately 3,000 guests were in attendance for the outdoor ceremony, including Walsh University President Richard Jusseaume, Provost and Vice President for Academic Affairs Dr. Douglas Palmer, Board of Directors Chair The Honorable Sara Lioi, and members of the Walsh University community along with graduates and their family and friends. 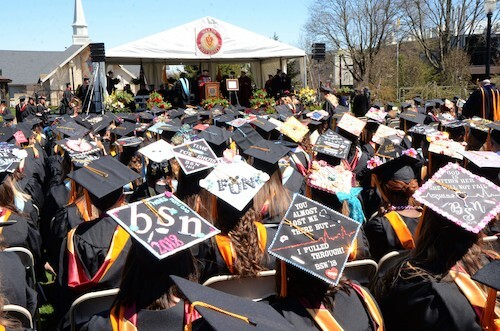 Commencement weekend activities also included the Baccalaureate Mass on Saturday, April 28. View more photos from the ceremony on our Flickr site. 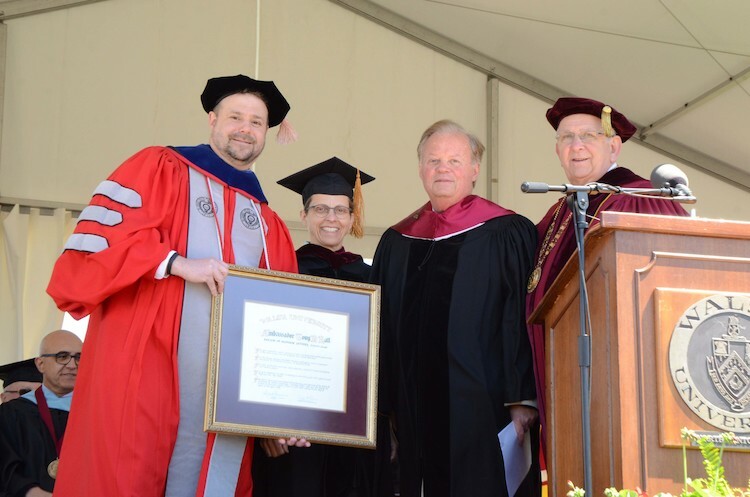 During the ceremony, Walsh honored Ambassador Hall with an Honorary Doctorate and Br. Guillermo Dávila, FIC, with the University’s Founders’ Award. In addition, the Senior Address was delivered by Tower of Excellence Recipient Staff Sergeant Jan Almasy ’18, who received his Bachelor of Science Degree in Nursing with a minor in Psychology. Almasy is a member of the 179th Airlift Wing, Force Support Squadron, in Mansfield, OH, and holds the rank of Staff Sergeant in the United States Air National Guard. In this role, he is the non-commissioned officer in charge of student flight. He assists in ensuring proper career guidance, healthcare benefits, and service requirements are provided to over 1,400 members of the 179th Airlift Wing. Jan plans to gain experience as a Critical Care Nurse and pursue an Active Duty Commission in the United States Air Force. Three times nominated for the Nobel Peace Prize, Ambassador Tony P. Hall is a leading advocate for hunger relief programs and improving human rights worldwide. Ambassador Hall serves as Executive Director Emeritus of the Alliance to End Hunger. "I wish each of you that full measure of opportunity. Justice and kindness, that we as members of the United States of America are privileged to enjoy," said Ambassador Hall. "Take time to think. Thought is the source of power. Take time to read. It is the path of wisdom...Take time to pray. It is the greatest power on earth. Take time to play. It is the secret to perpetual youth. Take time to give. It's too short of a day to be selfish...Take time to love and be loved. It is a God given privilege." The Walsh University Founders' Award was established in 1985 and is awarded to those who have achieved national stature by illustrating in their lives the same ideals that inspired the Venerable John de La Mennais and Father Gabriel Deshayes in establishing the Brothers of Christian Instruction, Walsh’s founders. These ideals are faith in God, fidelity to the Catholic Church, active concern for Christian education, dedication to authentic social justice and courageous promotion of human welfare especially among those less fortunate and disenfranchised. Br. 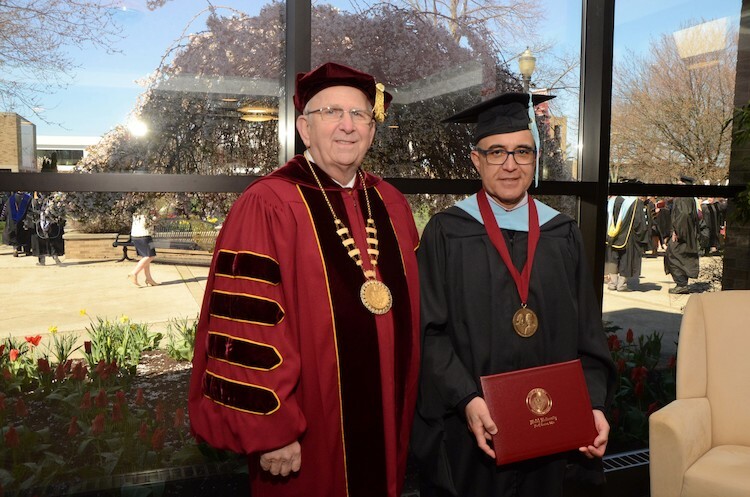 Guillermo Dávila’s relationship with Walsh University spans many years. He has been instrumental in the development of service projects and global learning opportunities for students to work directly with the Brothers of Christian Instruction around the world, particularly in Uruguay. 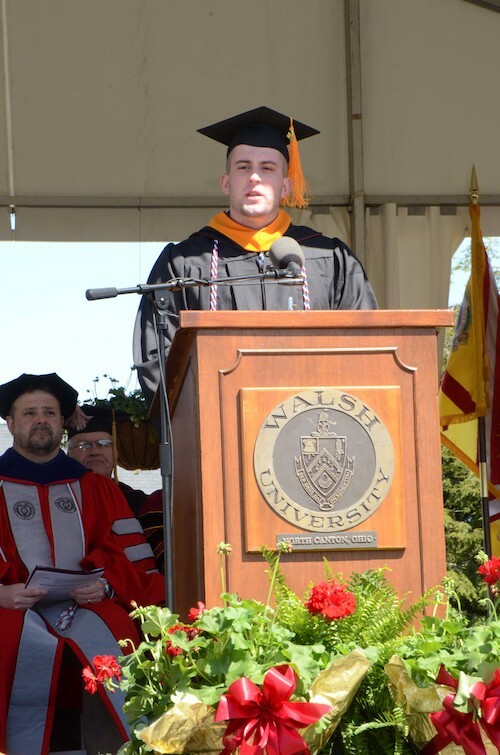 His connections helped to design Global Learning trips and activities for Walsh Honors and Education students, as well as those studying at Walsh’s campus at Castel Gandolfo near Rome, Italy. With Br. Guillermo’s assistance in Uruguay, Walsh students and faculty travel to Maldonado Nuevo where they spend time with the Brothers of Christian Instruction. Through these programs, students explore what it means to live out the Brothers' mission and work with students in their youth center. "Life never ceases to amaze us. An example of this is the recognition Walsh has granted to me," said Br. Guillermo. "The Brothers in this country founded this institution to recreate that first intuition giving the possibility of superior training to family members who did not have the means to access it. This University should continue doing what Jesus did: to be faithful to God’s message having an open heart to welcome everybody and to keep its own Catholic identity being ecumenical and inclusive..Walsh University should continue to rely on God to grant the increase."